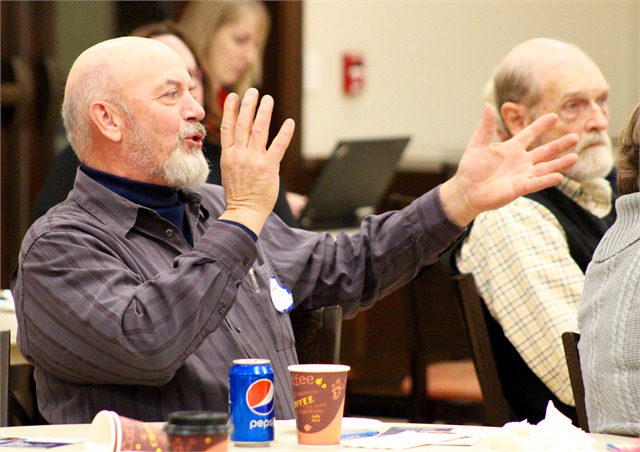 Guests wait for their notes to be collected during the Society's statewide engagement session Nov. 7 at Wade House in Greenbush. 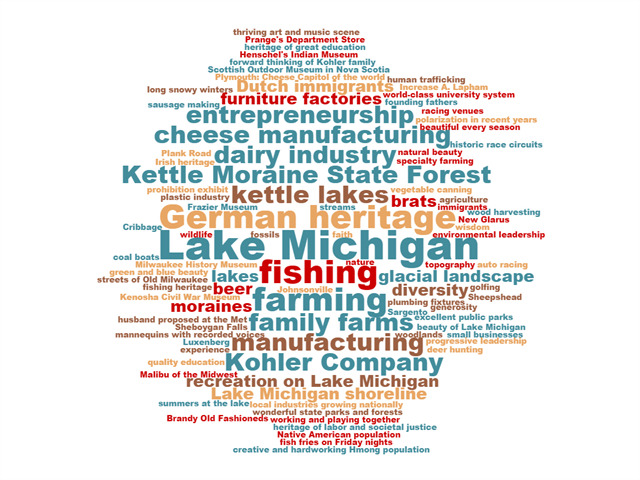 To help inform the new museum's "What Makes Wisconsin, Wisconsin?" storytelling theme, attendees were asked to write down things about their communities that the people across the state (and beyond) should know about. 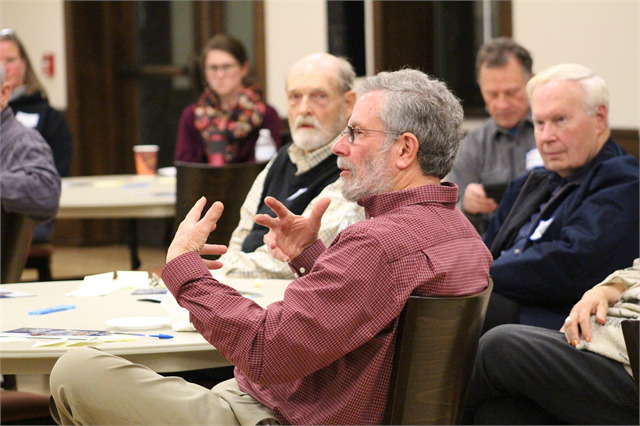 GREENBUSH — It was an evening of informative and meaningful discussions on Nov. 7 as Sheboygan County residents became the sixth group to gather for the Wisconsin Historical Society’s “Share Your Voice” statewide engagement tour. 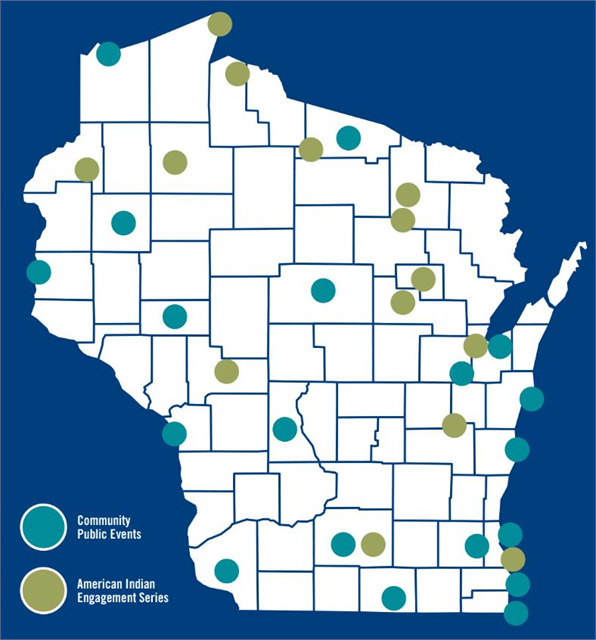 Plans for the Society’s new Wisconsin history museum are being shared in more than 30 communities across the state through June 2019. 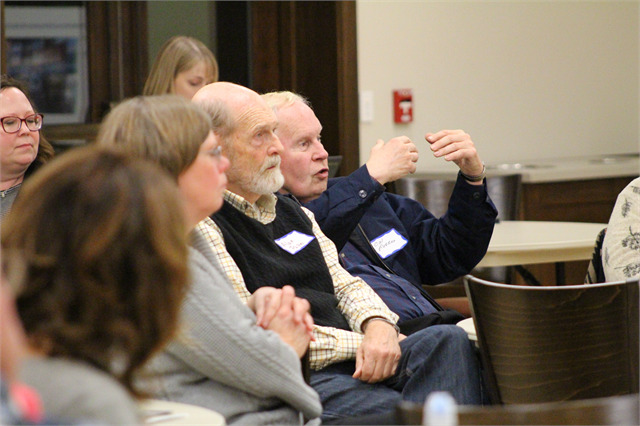 Sheboygan County residents gathered at Wade House in Greenbush, one of the Society’s 12 historic sites and museums, located about 20 miles west of Sheboygan. 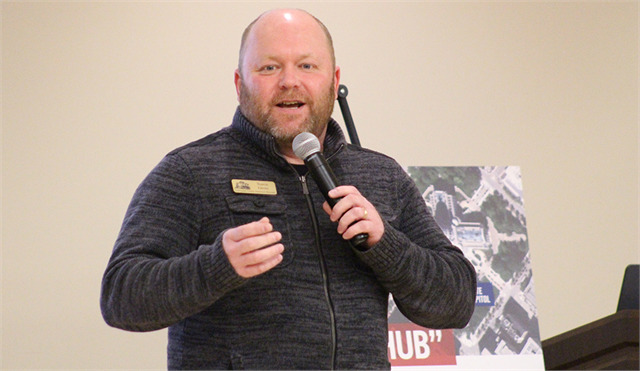 Wade House Interim Director Jim Willaert welcomed guests and introduced co-host Travis Gross, director of the Sheboygan County Historical Society. 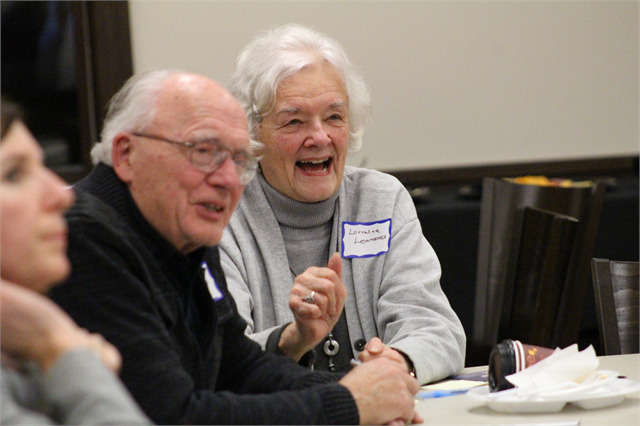 Gross noted that among those in the crowd were two longtime previous directors of his organization: Bob Harker and Betty Potter, who led the local organization for 21 and 14 years, respectively. Sheboygan County Historical Society Director Travis Gross, co-host of the session, welcomes guests to Wade House and recognizes previous longtime directors of his organization in attendance: Bob Harker and Betty Potter, who served 21 and 14 years, respectively, leading the local history organization. 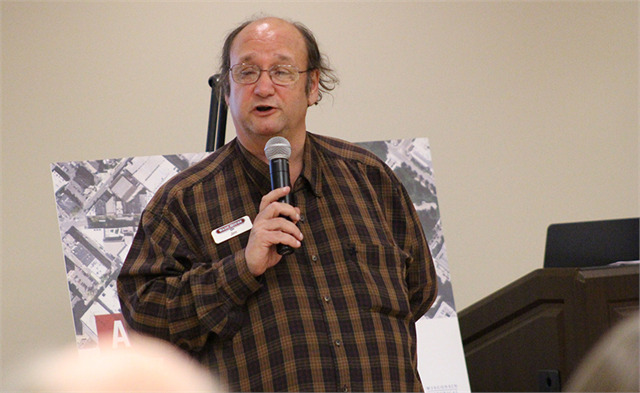 Gross introduced Christian Øverland, the Ruth and Hartley Barker Director of the Wisconsin Historical Society, who led the session. 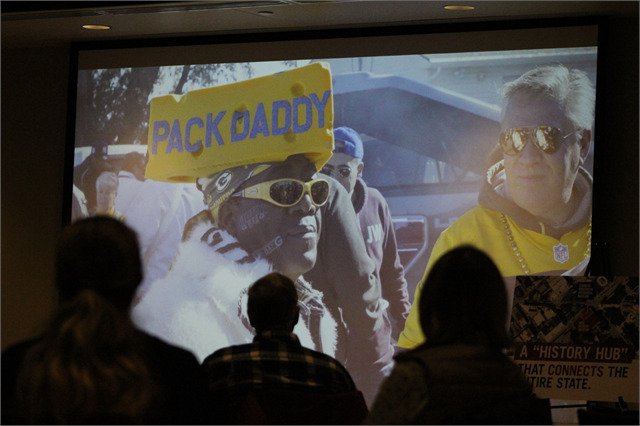 Øverland introduced the project with a video that highlighted the new museum’s overall storytelling theme “What Makes Wisconsin, Wisconsin?” He then engaged guests in activities during which they shared important local ideas and participated in a good discussion about their most memorable museum experiences. 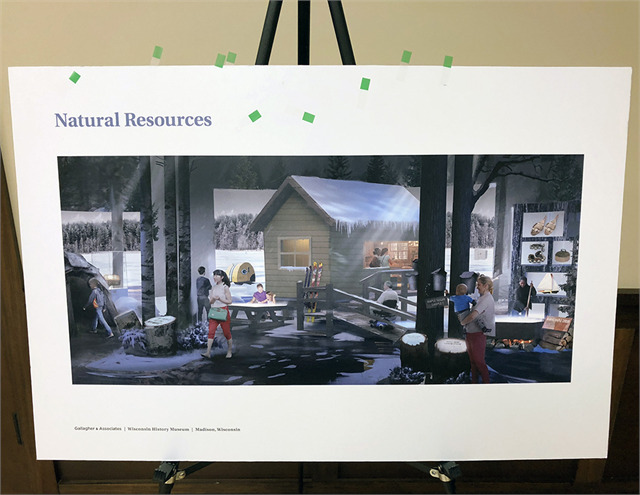 Guests were able to review early exhibit design concept renderings and place green stickers to indicate which ones they liked the most and a red sticker on their least favorite. Øverland then led a discussion asking people to share their thoughts about each rendering. 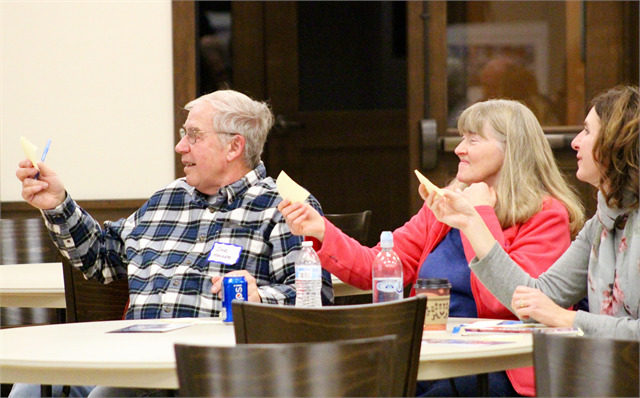 Attendees also used Post-It notes to share ideas about what people across the state should know about their area and its history. 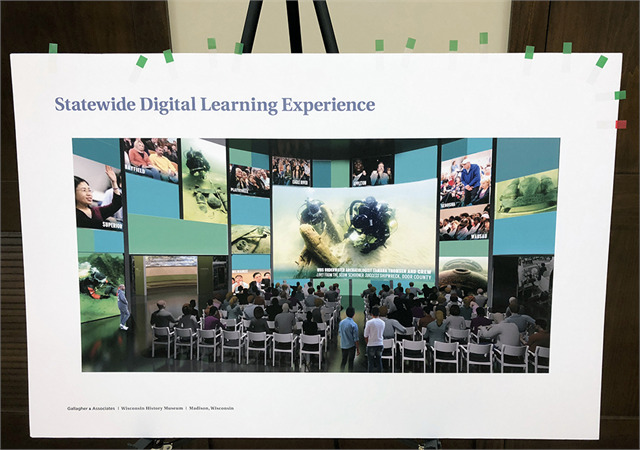 Those notes were placed on theme boards in the front of the room and were saved by Society staff to inform future museum planning as well as for creating word clouds to highlight most-suggested terms at each location and at all sessions across the state. 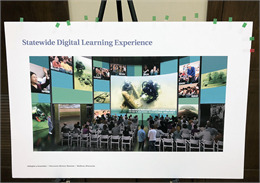 The most favorite exhibit concept rendering (shown at right) was titled "Statewide Digital Learning Experience," which showed how the museum introduction area and its giant video screen could be transformed into a theater for digital distance learning and live programming, with guests from locations across the state participating in discussions. It drew 13 green stickers. "I think it's phenomenal," said one guest. "It was my favorite thing." "With this, you're connecting real things," said another guest who felt recreating experiences in museums can sometimes feel "phony." But with live, digital programming "you're getting people really involved in authentic history." 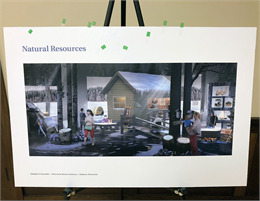 Another rendering that drew a lot of discussion was labeled “Natural Resources,” featuring a cabin in the woods, a Packers ice fishing shanty on a lake and the making of maple syrup, among other outdoor activities. One woman felt such an exhibit could have economic benefit. "Industrial Innovation" was another popular rendering, earning 10 green stickers. 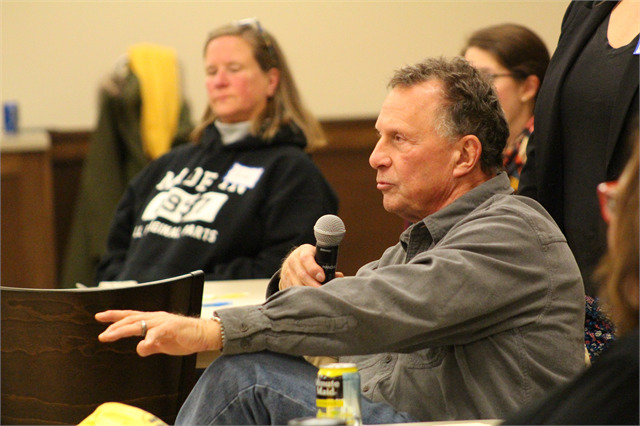 Guests discussed the many important businesses in the Sheboygan County area, including Kohler and Johnsonville Sausage. Others noted the storytelling possibilities that could come from the theme. 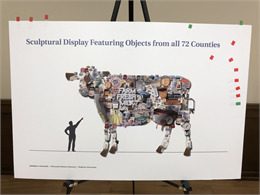 "Sculptural Display Featuring Objects from all 72 Counties"
Finally, the rendering that drew the highest number of red stickers and sparked the most debate — as intended — was the art installation of a giant cow that would be covered with items from all 72 counties of Wisconsin. Some called it "cheesy" or "distracting," while others said it's "an important part of Wisconsin" and they liked "that it's drawing things from every county in the state." As one person from a local history organization said, "Not everybody can come up here and see what we have." 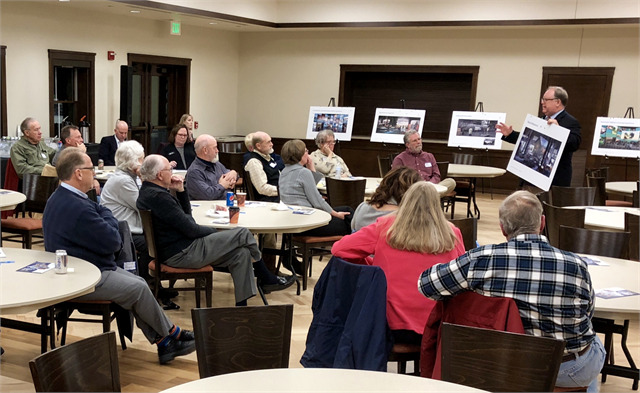 Christian Øverland, the Ruth and Hartley Barker Director of the Wisconsin Historical Society, discusses one of the new museum renderings with guests at Wade House. 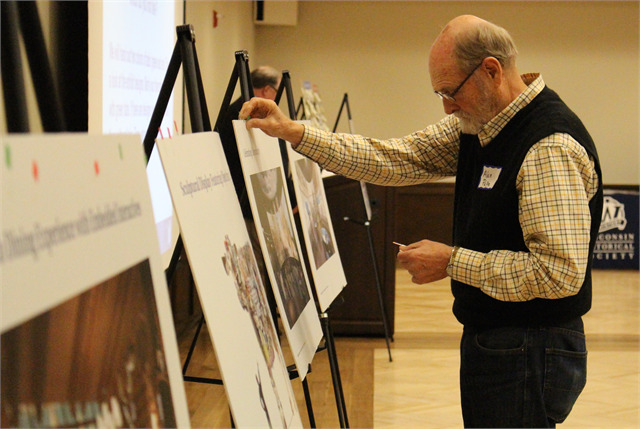 Guests discuss new museum renderings and their favorite museum experiences during the "Share Your Voice" session at Wade House. Guests place preference stickers on new museum renderings to show which ones they liked most. Jim Willaert, Curator of Interpretation and Collections and also Interim Director at Wade House, welcomes guests to the event at one of the Wisconsin Historical Society's 12 historic sites and museums. 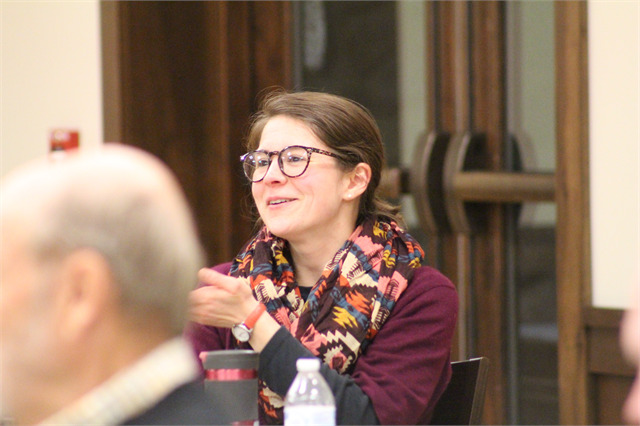 Bridgitt Zielke, Program Manager at the Kohler Foundation, shares her thoughts during a discussion about new museum renderings during the "Share Your Voice" session at Wade House. 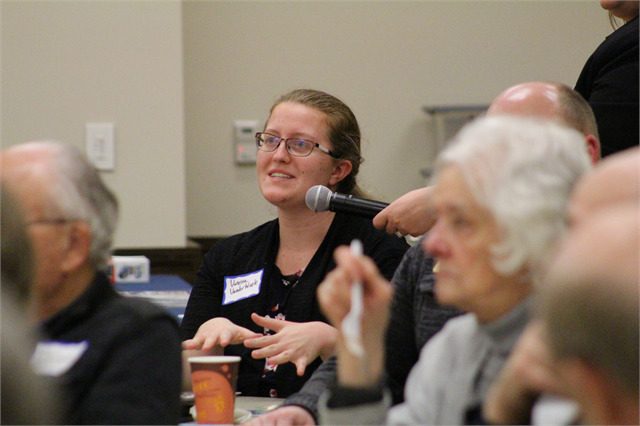 Vanessa VanderWeele, Operations Supervisor for the Fond du Lac County Historical Society, shares her thoughts on new museum renderings during the "Share Your Voice" session at Wade House. Guests watch a Society video about the new museum project and its theme "What Makes Wisconsin, Wisconsin?" during the "Share Your Voice" engagement session at Wade House. This word cloud is drawn from ideas written on Post-It notes by guests at the "Share Your Voice" engagement session at Wade House. 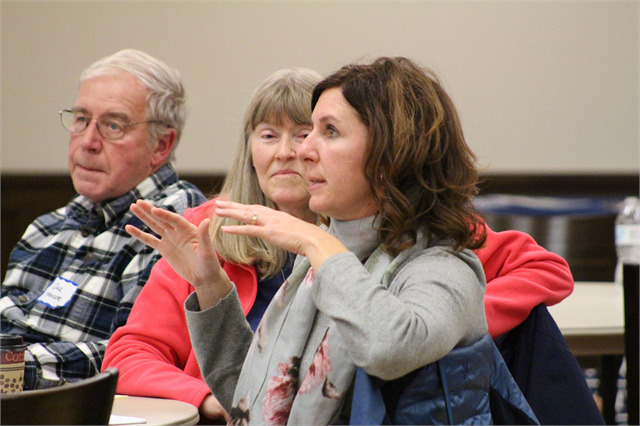 They were asked to share what important aspects of their Sheboygan County area should be shared with the rest of the state.